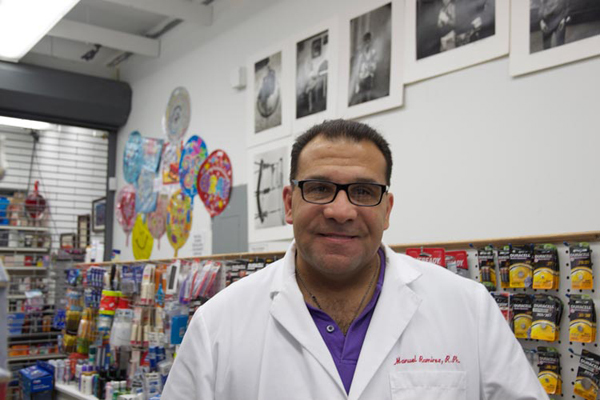 “We need this,” said Manny Ramírez of creating a community hub within his pharmacy. Imagine a store that sells veggie wraps with kale, pumpkin lattés and holds poetry slams. Its walls are adorned with the work of local artists. Sounds like an upscale café? Owner Manuel Ramírez, known as Manny to most, is pushing the boundaries of what it means to be a neighborhood drugstore. In addition to filling prescriptions and selling cosmetics, Ramírez says his business is all about how people feel when they walk in the store. A friend of his once told him that he should hang art on the walls and have a soda fountain because it would bring the community together. “I always wanted to do that, but my store was too small,” he said. Read more: Slams, soda, and syrup Recitales, soda y jarabe | Manhattan Times News.